Each box contains 20 packs. Each pack contains 8 cards. 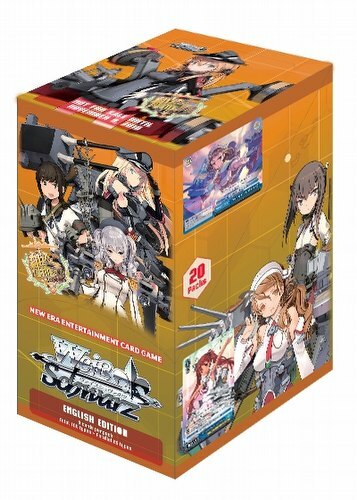 Bonus Offer: You will receive a free Weiss Schwarz KanColle play mat with every 4 boxes of boosters pre-ordered!Create your own deck with a ton of new fun cards included in the Weiss Schwarz: KanColle Arrival! Reinforcement Fleets from Europe booster set! 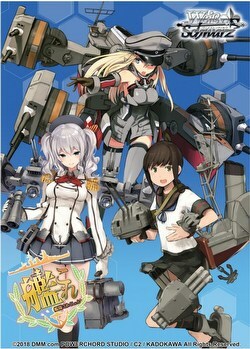 Foreign vessels have arrived on the scene, searching for an Admiral to lead the fleet. Joining them are popular Fleet Girls like Kashima and Taiho. Cards from this set can be used together with cards that have a number beginning with "KC/". 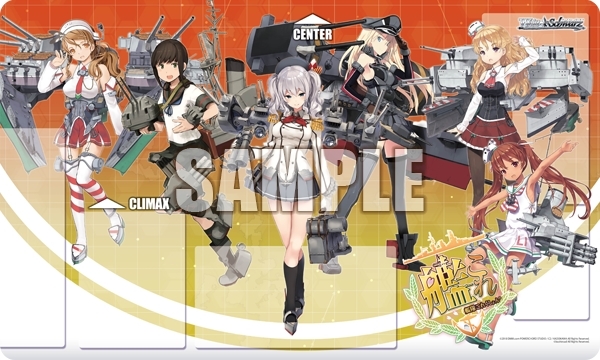 Look for SP Signed cards from Japanese voice actors randomly inserted in packs - Amagi (Yui Horie), Italia (Misaki Kuno), Taiho (Mamiko Noto), Bismarck (Aya Endo), Prinz Eugen (Ari Ozawa), and Kashima/Ro-500 (Ai Kayano). SP versions of Akashi (Risa Taneda), Akatsuki (Aya Suzaki), and Hatsukaze (Sarah Emi Bridcutt) are included as case toppers. Every booster box includes 1 of 4 exclusive promo cards. 100 cards plus 25 parallels in the set.